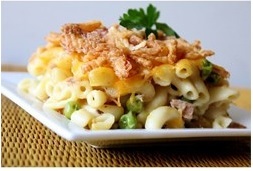 In a 9x13 inch baking dish, combine the macaroni, tuna, and soup. Mix well, and then top with cheese. Bake at 350 degrees F for about 25 minutes, or until bubbly. Sprinkle with fried onions, and bake for another 5 minutes. Serve hot.